DejaOffice now automatically creates a backup of your data for you – every time you sync! The latest release of DejaOffice for Android (1.12.3) introduced a great new feature that’s somewhat hidden behind the scenes: automatic backup. Every time you sync your data, DejaOffice automatically creates a backup first. Since this feature has the potential to be quite useful, I wanted to be sure to highlight it here. With automatic backups, if you accidentally delete a contact, or if your database were to somehow become corrupted, you can rest assured you have a backup to restore from. And DejaOffice keeps the 3 more recent backups, so even if you don’t notice an issue right away, you’re still safe. Ensure CompanionLink is not running on your PC. 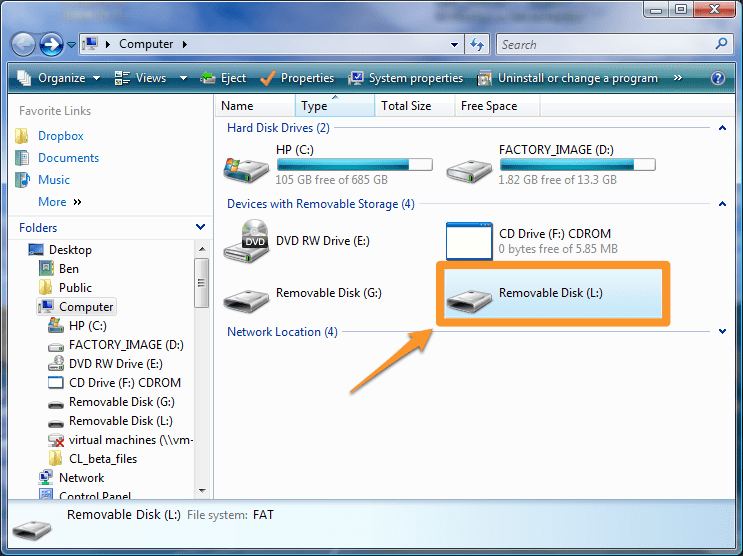 Open the “Computer” or “My Computer” folder on your PC, then select your device’s SD card/removable drive from the list. Browse to the “\clusb\backup” folder. 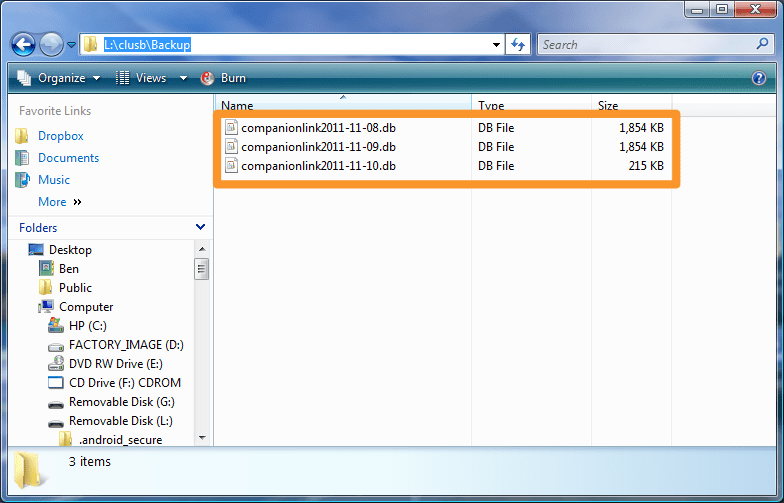 In this folder, you will see a file named “companionlink<date>.db” (e.g. 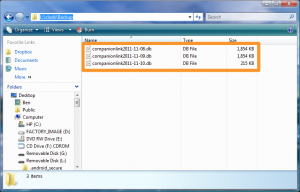 companionlink2011-11-04.db). This is a backup of your database prior to your most recent synchronization. Copy the file to the “\clusb” folder. Choose to replace the existing companionlink.db file if prompted. That’s it – your data is then restored to the date of that backup. If you have any questions or feedback about our new backup feature, let us know in the comments below! This entry was posted in Tips and Tricks and tagged android, backup, dejaoffice, sync, tips, tricks by David. Bookmark the permalink. anyone have this issue… Have had DejaOffice for a very long time, getting a new phone and wanted to back up, logged in, it said my subscription expired! I have been paying $14.95 per quarter. Sent message to support, never heard anything from them. Now looking to transfer all to Google or Outlook. I checked on this this morning. 1. For Billing, yes, you are current. However, your DejaCloud account was set to a gmail email address. I have switched it to your purchase email address. This will clear the message. 2. For Synchronization – DejaCloud is in Sync with your Android device on your account. However, no PC is synchronizing to that account. Looking back at the past, I see that you have used 3 different email addresses. So I suggest that you check your PC CompanionLink, and make sure it is set to sync to DejaCloud, and use your current email address (not gmail, but the one that uses your own domain). 3. The message to support that I see was posted Saturday. I’m sorry we did not respond if you posted prior to that. Sometimes we have staff on Saturday but normally we just work Monday through Friday. I hope this helps. I’ll have a tech reach out on Monday to help you with your settings. 2. 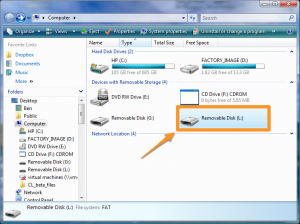 How can I BACKUP memo files so that if i inadvertently delete the wrong Memo I can recover. Thank you, thank you, thank you!!! I have been unable to get my calendar to sync with Google to back it up and just when I thought I figured it all out, instead of syncing to Google, my blank Google calendar copied over to my DejaCalendar! I thought, “Goodbye 10 years worth of calendar data!”. But this saved me. THANK YOU! Please can I have a copy of that email. I have a 6″ phablet with dejaoffice installed and it runs my life ! I have a 10″ tablet with dejaoffice installed and I thought the easiest way to sync them would be to copy companionlink.db from the phablet to the tablet. It copied over to the tablet, “Do you want to overwrite?” – yes. When I start dejaoffice, I get “Can’t find data file, do you want to use a backup?”. Any help would be appreciated. Please email me at social@companionionlink.com. I’d like to have one of our technicians contact you.